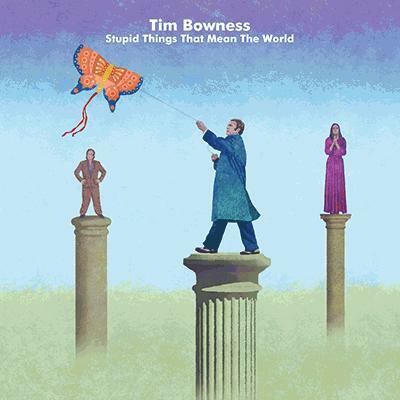 Review Summary: "I believed in whatever you believed in, stupid things that mean the world"
Tim Bowness, one of the most expressive voices in contemporary music returns with the second chapter of his brand new, solo sonic experiments. Released roughly a year after Abandoned Dancehall Dreams, Stupid Things That Mean The World can be seen as a direct follow-up that not only manages to consolidate his strengths, but also takes a step forward towards new territories. I was anxious to hear the results as the man never fails to create something interesting and gripping (at the very least). Although a sequel, STTMTW contrasts its predecessor in both the atmosphere it creates, as well as the emotions it evokes. Since the production is substantially airier this time around, it manages to unfold quicker than ADD, creating shorter, but profound tunes. We get cuts like the title track or 'Where You've Always Been' whose playful, sustained rhythms bring forth quite an unusual, uplifting side of Bowness we rarely get to see. However, this is only a part of a darker record that often feels tensed and frustrated. The characters he portrays have missed several opportunities over the years, feel overwhelmed by life, ugly or devoid of any feelings that once made them feel alive. The most representative numbers are 'The Great Electric Teenage Dream' and 'Press Reset'. There's anger in the powerful guitars and regret in the nostalgic piano lines, whereas the cold, industrial touch present especially on the latter, magnifies this uneasy vibe. Tim also delivers his parts with a poignant tone, boosting the tracks with some of his heaviest hitting moments. On the other side of the spectrum, we have two of the most gorgeous, subdued tracks on the album, 'Sing To Me' and 'Know That You Were Loved' lying in between the aforementioned rockers. They are a lot more comfortable for older fans as each shares similarities with previous helmed projects. 'Sing To Me' stemmed from a 20-year old No-Man demo, entitled 'Best Boy Electric', recorded somewhere in the middle of Wild Opera's recording sessions. Tim reworked it and created a lovely ballad with eerie guitar leads, warm bass and echoed piano lines. Sound-wise, it reminisces 'Smiler at 50' from ADD. 'Know That You Were Loved' is a mostly acoustic affair that brings to mind the low-key No-Man album, Together We're Stranger. Occasional lap steel touches and guitar solos embellish the stripped foundation, yet his voice is once more the focal point. There is a dark appeal to Stupid Things That Mean The World that some might or might not be fond of. Abandoned Dancehall Dreams was a melancholic yet grandiose affair that was easier to wrap your head around. This time, the often bare bones instrumentals push Tim's vocal melodies in front, usually focusing more on the lyrical content than the music itself. Moreover, helped by some elite members of the British nu-prog/art rock wave such as Bruce Soord of Pineapple Thief (who also produced the album), Colin Edwin of Porcupine Tree, long time collaborators Stephen Bennet, Phil Manzanera and Pat Mastelotto of King Crimson, Michael Bearpark or the classical composer Andrew Keeling (among others), Bowness has managed to avoid repetition and create a piece of work that truly complements its prequel. This is a beautiful, cohesive album that stirs so many emotions and speaks for itself. It might not be as immediate or as catchy as ADD, but does the most important thing: paving new grounds. Such a beautiful album that stirs up so many emotions. I love this man. Thank you Gyro. This is a great album, the first half is ace! it's a shame he isn't more recognized on here. seems like a lot of people missed out on last year's dancehall dream. Yeah, that album was so good and people weren't willing to actually check it out. I guess that's the case of many artists. Even so, I am glad he's developing his solo career since No-Man is stagnant. Also, his collaborations with Peter Chilvers (California, Norfolk) or Richard Barbieri (Flame) or Gianluca from NoSound (Memories Of Machines) are really good. I am really surprised. This album is so good when honestly, I thought it would be bad when recording took only one year. Probably gonna review it too. Great review, need to check out his other stuff as well as this. "This cover is too 70s"
"This cover is too 70s for the 2015s"
Excellent review! I haven't heard the whole album yet, but so far, every song that has been released individually was amazing at the very least. Abandoned Dancehall Dreams seemed to be some sort of redefining landmark, now I'm curious to see how Bowness manages to expand his newfound freshness' scope. It's a shame No-Man have gone into a hiatus - or disbanded, it depends on the way you see it I guess - but what Bowness has presented us so far is at least as brilliant, refreshing and innovative as the duo's greatest realizations, if not more so, in fact. Nah, this doesn't look like a cover from Rush or Yes at all. @kashmir - As much as I like this album, ADD shines brighter at times (Smiler at 50 or Dancing For You top the tracks from STTMTW). @Onirium - Thank you! Yeah, I'd love for No-Man to return, but at the moment Tim's solo career gets better and better. I have an interview with him that I'll publish today. Lots of details on these albums. Matter of taste. Gems like Where You've always been, Press Reset or Everything You're not(with Peter Hammil) shine even brighter for me. Here's a brand new interview with Tim.